Airbag suppliers, which have developed an array of airbags, side curtains and knee bolsters to protect front-seat occupants, are starting to design a new generation of airbags for rear-seat passengers. TRW Automotive Holdings Corp. has unveiled two airbags -- one mounted in the roof, and one in the back of the front seat -- that could protect rear-seat passengers during a frontal collision. The new airbags are likely to debut in Europe, which has mandated crash tests for a dummy the size of a 6-year-old in the rear seat starting in 2016, says Steve Peterson, TRW's North American director for occupant safety systems engineering. "Europe is a little bit ahead of the U.S.," Peterson said. "We've got some customers in Europe that want to deploy a rear bag from the roof, and some from the front seat. We are studying this with several different customers." About half of crash-related injuries to rear passengers are caused when the occupant slams his head into the front seat, or when a tight-grabbing belt injures the occupant's chest. A package of airbags, seat belt pretensioners and seat belt load limiters can minimize those injuries, Peterson said. Last year, TRW introduced a roof-mounted airbag in the Citroen C4 Cactus hatchback. Although that airbag is intended for front-seat passengers, it could easily be adapted for the rear seats in larger sedans and crossovers. For small vehicles, a seat-mounted airbag would be a better fit, Peterson said. That airbag, dubbed Scarab, looks like an upside-down "U." The airbag's technology isn't much different from that of a knee airbag or a curtain airbag, Peterson said. In the past, safety regulators paid little attention to the rear seat because it is used infrequently. According to a survey published in December by the Insurance Institute of Highway Safety, only 12 percent of vehicle occupants involved in crashes from 2007 through 2012 were in the rear seat. But the study noted that the risk of death for seat-belt wearing rear passengers was significantly higher than for front-seat occupants in vehicles built after the 2006 model year. The risk was highest for passengers who were 55 and older. 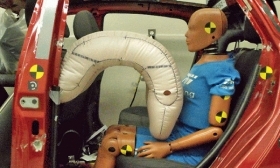 The Insurance Institute for Highway Safety took no stance on the likely effectiveness of rear airbags. U.S. regulators are showing interest in rear-seat safety. While the New Car Assessment Program does not evaluate rear seats in frontal crashes, the National Highway Traffic Safety Administration has begun to study the issue. The agency is conducting crash tests to evaluate pretensioners, load limiters and inflatable safety belts for rear passengers. In addition, NHTSA is partially funding a joint airbag study by TRW and the University of Michigan Transportation Research Institute. Results of that study are expected this summer. If future NCAP ratings require better rear passenger protection, automakers will add airbags, Peterson predicted. "There are technologies that can be put into the rear seat, but there is no incentive to do it yet," he said. "We need some sort of test."